Featuring a heated outdoor swimming pool and a restaurant serving local produce, Aval Du Creux is a stylish and modern hotel at the top of Harbour Hill. The elegant stone buildings of Dixcart Bay Hotel offer 4-star accommodation on the island of Sark. Just beyond the hotel gardens a web of paths leads through woodland, vineyards, along coastal cliffs and down to sheltered bays. La Moinerie's stone buildings and lodges are set on the site of a medieval monastery on the Channel Island of Sark. 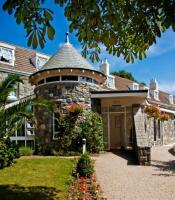 The hotel is set in a quiet, secluded area on the west of Sark, surrounded by landscaped gardens. On arrival and departure guests travel to the hotel via a horse-drawn cart down the winding, cobbled lane. Guests of La Moinerie are able to use facilities at the other three Sark Island Hotels and Red Room Snooker Club. The Stocks Hotel is located in Sark, United Kingdom. Overlooking Pirates Bay and just 200 metres from Banquette Bay and 400 metres from Brecqhou Castle Hotel. Restaurant and room service on site, satellite television, complimentary parking provided, Wi-Fi access available (with surcharge). Our rooms have hypo-allergenic bedding, complimentary toiletries and a full turndown service is available.